Thanks, Sherry. I completed my reading assignment and then as requested, I stopped the scans and rebooted and Webroot did a 32 second scan (or so it says it did) - not the 55 min. complete scan. Does that sound right? At this moment there are no scans going on and the next one is scheduled for 20 hours from now. However, I am pretty sure that it will start doing another complete scan (or two simultaneously) during the next few hours for whatever reason. Aslo, is waking up from Sleep treated the same as a reboot - that is, will waking from Sleep initiate a scan? The reboot scan is just a quick scan that is looking at running processes, that is why it only takes 30 seconds. You should only have one scan running. I would check your Scan settings and see when your Mac starts a scan. Please look here at the Mac User Guide. I would advise you that you stop the scans and reboot your system and see if Webroot scans on restart. If this keeps having two scans then I would uninstall/reinstall Webroot and I can give you exact instructions how to do this if you would like. Or you could Submit a Support Ticket free of charge and they can look into this for you. I would think the Webroot scan would take abit longer. But it depends on how new your Mac is. Let me ? our Mac Threat Researcher and he can asisst here in terms of Sleep mode and the scanning? Thanks. My MacBook Pro is 5 years old. Another question. Does Webroot search for ransomware - and if "yes," are ransonware and viruses identified only during regular scans or are they detected "live" so to speak as soon as a website or email is opened? Thanks. WSA does provide excellent protection against Ransomeware, but keep in mind that new variants are constantly being released in an attempt to stay ahead of software like WSA. In some situations where it has gotten past, Webroot Support has been able to help by way of the rollback, etc. Webroot will detect Virues without scanning.so yes it is Live! My Mac is 8 years old and it takes over an hour to scan. So I really can't say how long your scan should or would be. 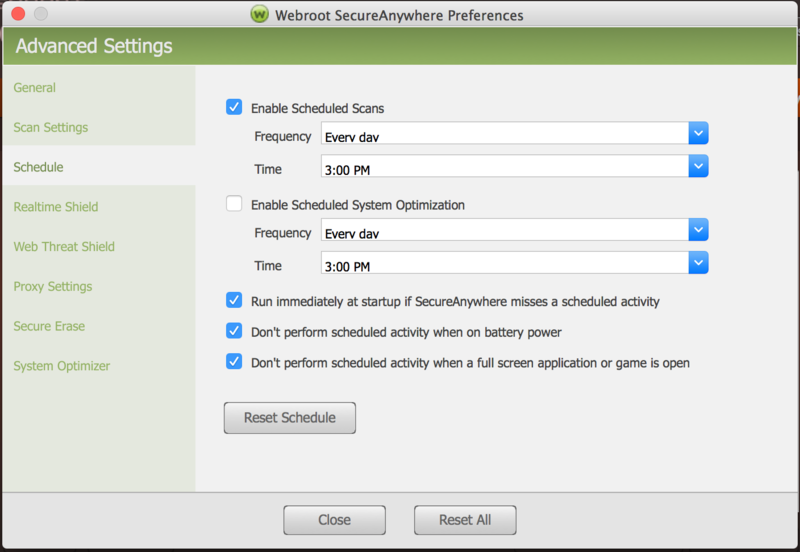 Take notice when Webroot scans again and see how long the duration is. Thank you, Sherry. Very helpful. I appreciate it. Sorry, didn't see the sleep reference. That determines your settings. For instance, these are my settings and I have mine set to run a scan immediately if the scheduled one was missed. For some people, this isnt a good idea because they dont use their macbooks as much, so it is always missing scans. I am always on mine so I rarely miss the scan.